Start your breathing and movement with a few deep breathes to settle yourself before engaging in exercise. This helps to calm the nerves and clear the mind. Exercise is a mostly done to keep one’s body in shape. Many associate it with exhausting physical exertion; but, it offers much more than that. When a person gets into the flow of breathing and movement in swimming, they have set a steady tempo. They become more conscious of their breathing and how its regulation slows the heartbeat. This consciousness creates better swimming. For swimmers, there is nothing as relaxing as slicing through the water in long, fluid strokes and feeling the how effortlessly the body moves forward. Swimming is an ideal exercise, as it is done in cool surroundings – all kinds of pools and open water; it is fun, and yet still works all the major muscles. 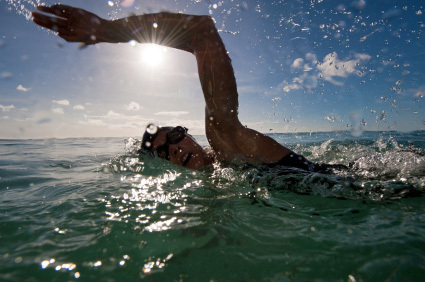 Breathing and movement for unnatural and Natural swimmers takes a few moments to adjust when hitting the water – unlike ocean life that lives in the water. With the first few strokes, their arms and legs propel them forward, and it takes just a few seconds for their bodies to establish a rhythm. In order to create that steady rhythm, a swimmers breathing must be in sync with his movements. As he makes a stroke and core rotation while maintaining buoyancy, he must time his inhaling and exhaling just right. When doing regular exercises, above ground, a person need only focus on taking deep breaths through the nose. This brings about a feeling of calmness and at the same time stimulates the nervous system. A person’s heart rate slows down, and their concentration focuses on the task at hand. As they forget all other concerns, they become focused on applying their energy to the exercise they are performing in y’chi fashion. However, for swimmers, breathing and movement is somewhat more complex. Not only are they having to coordinate their arm and leg movements while executing each stroke, they also have to establish a rhythm between the mouth and nose. As they swallow air through the mouth, they will need to expel it through the nose at the next turn. With the first strokes, swimmers often feel their facial muscles working almost as hard as their arms and legs in keeping pace. It takes up all their faculties and concentration to remember the right movements in breathing. In some instances, the breathing becomes difficult as the nose begins to run. However, this is only short lived as the nasal passages become accustomed to the exertion they are being put under. Through repetitive actions, a swimmer can program his mind on how the breathing and the swimming should be synchronized, once done it becomes much easier and more enjoyable to exercise. The goal is to make breathing an effortless task so that the swimmer can eventually focus his mind on physically tasking himself. The pace at which he executes each stroke should now become his focus as breathing becomes automated. With each deep breath, the mind will unconsciously link the heart beat. Each slow breath will lead to a slow and more relaxed heartbeat. Even as a swimmer moves faster and exerts more pressure, a steady breath will lead to a steady heartbeat. Many top athletes are known for managing to end a fierce race with a slow and easy breath despite a perceived fast heart rate. This is because they manage to slow their breathing rate and match their heart rate to it. They always end a tough session looking and feeling more relaxed than when they started. Using that connection between mind and body, they achieve a higher state of calm and a much faster recovery time. Once an athlete can master how to control their breathing, and link it to their heart rate, to steady himself, he can draw from this connection if the level of excitement should rise. In swimming the same applies, a calm and steady rhythm can be sustained effortlessly when the breathing is synchronized to the execution of stroke movements. Managing that steady rhythm is dependent on how well a swimmer will regulate their breathing and maintain a sense of tranquility which in turn makes you swim better. Do you have a favorite drill? What is your favorite swimming drill? Share it and tell us why!